The Carlisle GM Nationals car show was held last weekend at the Carlisle Fairgrounds. One of our guests entered his 1963 Buick Riviera in the Show Field Competition and won 1st Place in his class!!! The car had belonged to his grandparents and was well maintained over the years. Congratulations Darrell on your winning entry! We also have some artwork being produced here at the B&B. This talented person had not painted in over two years, but now has a bit of free time as his daughter takes ballet classes with the Central PA Youth Ballet. It's great to see what a little free time and relaxation can allow a busy person to create! Here is the subject for the artist: the interior of our horse barn. The resulting artwork makes our place seem even more serene and peaceful. Beginning on Thursday, June 28th, it's time for SummerFair in Carlisle! This week-long celebration represents the BEST of "small town USA"!!!! All events are FREE including ice cream after the Friday night parade, the musical, "Pajama Game", a concert by the Harrisburg Symphony, historic walking tours, and fireworks and more! "The original staycation" began 35 years ago and just gets better every year. 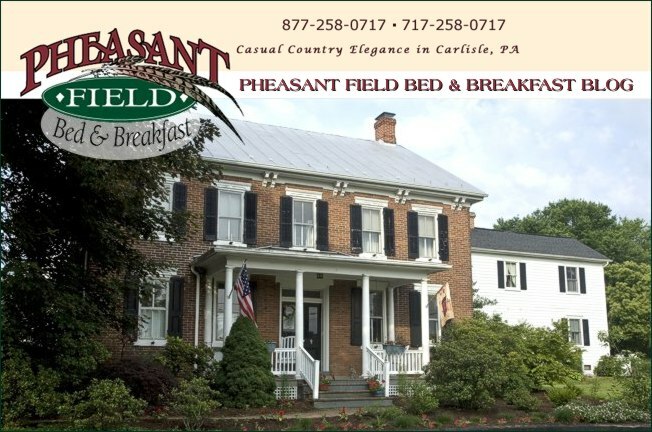 Come visit Carlisle, check out the schedule of events, and enjoy a restful stay at Pheasant Field Bed & Breakfast - and do it quickly before the Chryslers come to town!